Today’s note is chock-full. Here are four things I’d like you to know about today. Come make your home with us. 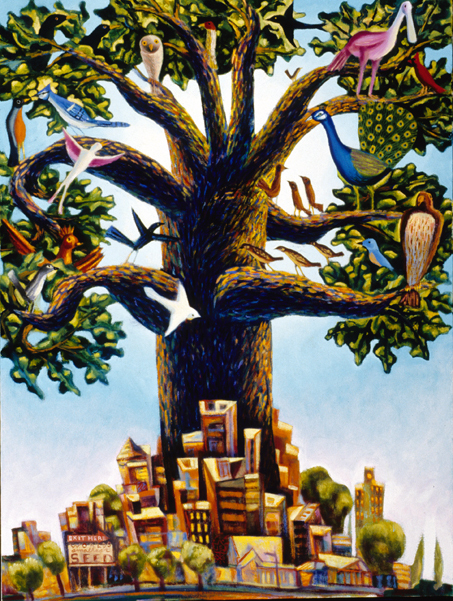 God’s kingdom in Austin is like a tiny mustard seed that grows into a tree, “ . . . so that the birds of the air come and make nests in its branches” (Mt. 13:32). As this powerful piece of art by local artist Jim Janknegt suggests, the King and his kingdom reign in the heart of the city. Christ Church is a branch giving shade to the city, a branch where birds of the air like you and your friends can make a home. Is exploring membership your next step to making Christ Church home? On Sunday, March 4th, we hold our next Membership Class, 1:00-4:00pm at the Tex Fed. If you are not a member, I want to invite you to this next step of exploring the commitment. Come hear more about Christ Church, our history and future, our calling and convictions. It is our deep desire that no one stand alone at Christ Church. To sign up just let drew@christchurchofaustin.org know you are coming. I’d love to see you there! For the past several years we have promoted a Lenten book for us to read together as a parish. This year’s selection is Humility, by Andrew Murray. The more I live, the more convinced I become that this is the root of all holiness. We will never grow if we think we’ve arrived. We will never listen if we think we know already. We will never repent if we think we’re doing alright. We will never submit to another’s idea or approach if we think we have a lock on the right next step. Andrew Murray was a 19th century South African pastor whose enduring writings have challenged many generations. Copies will be available this Sunday. Speaking of influence upon many generations, we celebrate the loss of one of Christian history’s greatest evangelists, in any century or any language: Billy Graham. This Sunday’s Holy Eucharist will be celebrated in his honor. Lord, raise up a new generation of evangelists and bring revival! Finally, a reminder that (1) this Sunday we bring our financial pledge cards forward to the Lord’s Table as an act of worship and participation in His mission; and (2) we now have online giving available by either visiting our website or texting ccaustin to 77977.